Like my Photos & Art? Here you'll find them for sale or license. Alantherock is selling through several channels. Here’s how the idea and structure are behind it. It’s categorised into three main sections and sales channels. Which is Nokuko.com , Society6.com , 500px plus Indieframe. As a co-founder of this site and project - This is where my most popular and favourite edited photos and graphics artwork is available. This is to contribute and support my own project, so we can help other upcoming artists. Plus to avoid to much noise and only showcase the finest and has the highest demand. In other words - Here you find the best of my best. If you haven’t visited the site yet. You should definitely check it out. 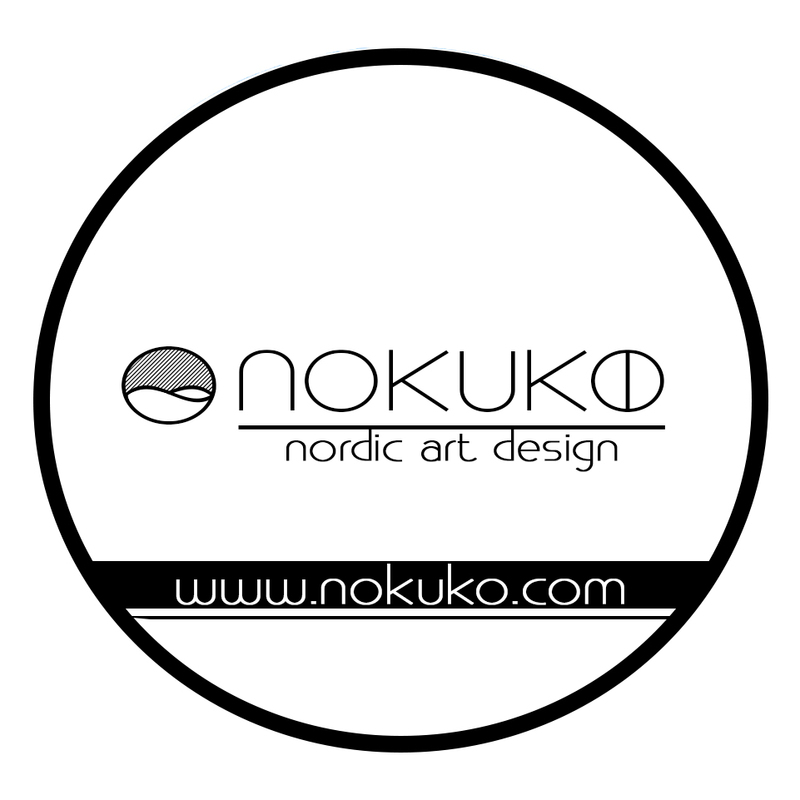 Click here to visit nokuko.com. This is my creative playground and ideas is blooming. This is where I offer a large range of my edited photos and artworks. The best and popular are being picked to Nokuko.com. Society6 prints on almost anything. Whether is on t-shirt or cups - you’ll find it here. Check to what’s coming and for more photos and art pieces by clicking here. Both sites are used as galleries of my photos, where there’s a possibility for license my photos for media, private use etc. Both 500px & Indieframe only contain photos and no graphic design or artwork. These sites will be updated regularly with new photos. 500px is primarily for my edited photos. which gives the last finish. Indieframe has both unedited and edited photos from both cameras and smartphones. You’ll find my 500px account here. You’ll find my Indieframe account here. We’re really looking forward to seeing, how this will evolve and contribute has a helping hand to artists located in Nordic countries. My photos and artwork are also to find as part of the launch collection. There will be adding new photos and art continuously. So remember to visit the site once in a while. - If there’s a photo, that you really like and isn’t part of my photo art collection at www.nokuko.com. Let me know via the contact form here. Last, but definitely not least - I’m really interested in our opinion and general feedback. So let me know, what you think either in the comments or via the contact form as mentioned before. It finally happened. The download section is now to found at alantherock.com. Here can download materials be found. First thing is cellphone wallpapers from my Instagram stories without any text. I have been asked for these pictures for a while now. So I'm pleased to answer the demand now. The section will continuously be updated. So remember to check it for new things every now and then. By the way - Did I mentioned that all the cellphone wallpapers are free. I'm just delighted, that you like my work and it's more than appreciated. You'll find the section either portfolio site, the menu or by clicking here. Instagram has just introduced a new great feature in stories. Now you can insert two option polls to your stories in just a few touches. This means that you can now be more active with your Instafriends, followers, or audience. Simply go into your Instagram story screen. Take a new photo or add a recent photo (within the last 24 hours) that you want to post. *keep in mind, that I’m using Instagram in Danish language setup and therefore this can vary from other languages. Furthermore, this is done on an IPhone and the android version can have some minor variations from this. Here I am using a photo which is spilt into BW (black & white) and colours. The question is which style do people prefer. Now there’s a feature, that when you swipe up on the screen, you are able to add location, stickers, hashtag, etc. Then the next screen will appear, here you can ask a question (or what you prefer), and underneath you can give two options for people to interact with. These two buttons are for your Instafriends, so they can tap it to show their opinion. After filling everything out, you are ready to post your story. The new feature gives stats on which option is tapped the most. 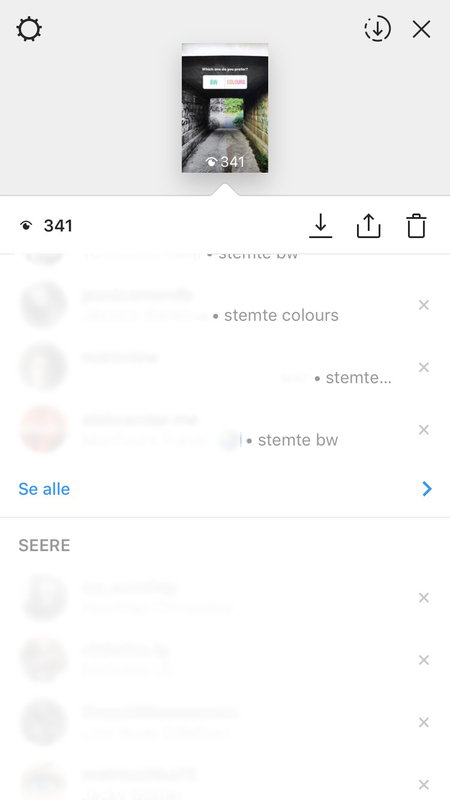 Your Instafriends can’t see the result until they have also tapped the button. But for you as a creator of the story, you can see more stats than just the percentage. You may already know that it is possible to see who has seen your story by swiping up. It’s basically the same thing. But it has a slightly different look. On the first screen print below, you can see that at the current time colours were leading by 70 percent. But when you now swipe up to see who has seen your story. It’s now possible to see the outcome of the votes; who has voted, plus what they have voted on. You can of course still see how many actually have seen your story and whom. On the 2nd screen print here, you can see that 36 people voted for BW and 64 people voted for Colours. this includes everyone from the voting section as well.) “Seere” means viewers in Danish. It is a great tool to interact with your Instafriends, whether you’re using for fun or for more serious matters. In other words, for either private or commercial use. This feature gives many possibilities in a simple way. I know that you are setting the frame for the poll or research itself. But you still get a minor insight into your Instafriends’ thoughts. Which in some way indicates that you are showing interest in them. So use the collected data to generate some kind of value for your Instafriends. The more your Instafriends feel their opinion matters, the more likely they will be to continually interact with your stories. In this example, my Instafriends have an opportunity to influence me on my next photo, based on their voting. I will not use it every time, but it is a good and fun way to interact. If the voting favours BW, my next photo will most likely be in BW. If I have an insight that my Instafriends would prefer to see more BW photos, then they will get a result for actually participating in voting. · The research is: What kind of photo will people want to see? · The result is: Next photo will be in that style, because their opinion matters. · The value is: A mutual feeling of being heard and positive interaction. After that, I would go back to my original style of photos or what I think is cool. · If you’re a private Instagrammer – You have the option of letting your fellow friends take part in fun and more serious decisions from what kind of coffee to maybe a new car. · If you’re a fashion blogger – then you can give your followers a fun choice of maybe what kind of dress or jacket you should wear the next day. · If you’re having a giveaway – maybe the choice of the giveaway prize can be voted on. · If you’re business to consumer (e.g., a telephone company.) - Which phone is your audience most looking forward to seeing? Then the company has a minor insight into which phone brand their Instagram audience most want to see offered, pictures or information from. · Who should win. If you have two finalists and let the audience decide who should win. Then you’ll also give the finalist an incentive to spread the word. · Here there are endless possibilities for all of them. It’s all about being creative. The list could go on with ease. But nevertheless, I really think it’s a great new feature as you might have guessed. This is a great tool for interacting and getting to know your Instafriends, followers or audience better. So why not use it sometime. Remember that you still can combine it with location and hashtags. By the way – the voting ended with that picture and colours won. So, the photo was uploaded to my gallery the next day in colours. Short Trip to Iceland - Amazing landscapes and a learning experience. So some weeks ago, I went on a short trip to Iceland. It was only a couple of days, but enough to convince me I definitely need to come back again. I had never been to Iceland before. But what an amazing country – If you like hiking and nature in general. A land, which has a lot to offer and is full of amazing landscapes. Perfect for what I like to take photos of (as you may have seen on my Instagram profile). Which was also one of the main reasons, where I gave this volcano island a visit. • A short introduction of Iceland and where you can find more information. • Last some photo samples from my trip. Iceland - What and where? Iceland is an island localised in the North Atlantic Ocean(65'N,18'W). It’s an island with huge contrast in landscapes from being a mix of volcanoes and lava fields to geysers, forest and hot springs, all surround by the relentless sea. Iceland is also located at the beginning of the latitude to the Arctic circle. Which means long days during the summer and vice versa during the winter. This also means that you might have the possibility to see the Northern light. Unfortunately was I unlucky regarding cloudy nights while I was there (something you can't control). Even though the land is the 18th largest country and approx. 103,000 km2. The population is around 332.000 people. Thus a lot of inhabited land to explore and discover. National language is Icelandic, second language is English and third Danish. Fun Fact: Iceland is the youngest country in the world. The source and for more information as well, check: http://www.visiticeland.com/ Here's also information regarding activities and the beautiful sights. Unfortunately, I wasn't very lucky to see the Northern Lights due to cloudy nights. Even though it sounded like it wasn't a big deal on my fellow Scandinavians, I would have been delighted to see it for the first time and it was definitely one of the big hopes to see it for the first time. Well.. it's giving me one more excuse to visit lovely Iceland again. SO a huge lack of research from my side. Here's some advices. Iceland is huge and you will spend much time in a car. Maybe even more due the winter time because of the road condition (which can shift quickly from clear weather to a minor snowstorm). The maximum speed limit in Iceland 90 kilometre (56mph) and there can be lots of curves, so if you have the possibility and time, maybe book a night or two in multiple hotels around your trip in Iceland. And don't assume that you can see everything in a week. Iceland has a lot to offer. Another thing (which I find brilliant) is that you have to walk a while to see the attractions. The parking space may often be located a few kilometre from the actually attraction, for example, Glymur and the plane wreckage. Don't expect just to drive all the way, get out of the car and a take few shots with your camera. Also strongly remember your hiking boots and clothes suited to the activity. Last and maybe the most important advice. If you haven't considered to visit Iceland. Do it. It's simply amazing and a great experience and the Icelanders are lovely and warm people. They will always help you and give advice if needed plus nearly everyone speaks fluent English. So no worries. Furthermore, if you speak Danish, then you're double guaranteed against any communications gap. Danish is still the official third language in Iceland (source visiticeland.com). Welcome to my new website. What do you think? This has been in the making for a while. I'm delighted to finally present it. - with good reason! Here are some of the changes, which I have chosen to highlight. · The look & style: A new and sharper style in black and white. The reason for this is that the photo and content will be more visible with this B&W minimalistic temple. It will emphasise the colours from the photos and deliver a more modern and stylish frame to the more colourless photos and text content. The blog is also much more integrated with the website and everything is being delivered to you in a better and more gracious way. · New logo: Along with the new website comes a new logo. This is also created in a more minimalistic way. Still with the characteristic three mountain tops from the old logo but with a sharper typographic. · New content: Of course new content will constant appear on this site. Both on the blog here, where reviews and travel experiences will be published. New photos and where to find them. Features will also be updated. Since the last update - My photos have been shown on tv2lorry's Instagram profile, Won a competition on Indieframe & on Go Visit Denmark (Official Danish travel guide). · New Possibilities: But on top of all that, there is much more in development. This will be revealed in the next couple of months. Can't wait to show you! So with all that - what do you think? especially compared to my old site. I would be delighted if you leave a comment with your thoughts. Welcome to my temporary site. Within the next couple of weeks, my website will change to look like this. The reason behind this, is because the old wasn’t good enough in almost every way or form. It simply needs to be much better from any point of view and especially visual. Even Google wasn’t a fan and everyone likes to be friends with Google for several reasons. So while my new website is under serious development and freshen up I have created this temporary website. There isn’t much new content compared to my former one-page website. But here’s a small recap of what has changed. The site should be much easier to navigate, especially regarding my blog post and portfolio. My portfolio section which has been divided into three sections – My Instagram Gallery, Featured and Society6. Instagram Gallery – the name says it all. But here you’ll find a sample of my Instagram Gally plus a direct link. Featured – Here’s a selection of where my photos have been featured. Society6 Store – a short introduction and direct link to my society6 store. Furthermore, the signup form for ‘alantherock newsletter’ is better integrated into the sidebars. This is along with my blog posts and social media links. Speaking of social media some new initiatives are in development. That’s is basically the new major features on my site. I hope that you’ll like my website and you’re always welcome to send me an email if you have any questions or just general feedback – I would like to hear from you. Thanks and I’m really looking forward to revealing my new website and what’s in the making. But this will be soon enough. Take care and have a brilliant day. Kind of geeked out the hard way with this investment. So this happened a couple of days ago.. where I kind of geeked out the hard way with an investment. I have long considered a slightly better camera to increase my photo performance and possibilities. In other words, stepping up my game in this part. I have mostly been using my Iphone and a compact camera Sony Cybershot DSC RX100 Mk II (which is simply lovely). Together with a little tripod, this camera has been absolutely amazing for my use until now. I could always bring it along anywhere and I learned to use it quite well. I also have an old Canon EOS 1200D, which is great but huge. So, therefore, after several hours, maybe days/weeks of research I ended up with… a Sony Cyber-shot RX10 Mk III camera. Yes, it’s the one on the photo. Makes completely no sense regarding what I just said about the Canon. But hear me out. By the way, I should emphasise that this is not supported or advised in any way. Just to make that clear. This is only my thoughts. Here is the base for my thoughts, which I will try to explain to both you and still myself. I haven’t spent so much on a camera.. ever.. plus all the needed accessories. When I left the photoshop, I nearly shed a tear (insert irony here, but still). This is clearly one of the downsides of this camera. It’s expensive. But why did I buy it then.. well, here goes. I wanted to step up my game and it’s a good all-round camera. I knew from the canon, that I wanted a fixed lens as I don’t want to change lenses or objectives when I’m out using my camera. It should be as easy as possible. With this camera, it’s a fixed and with a widespread – from 24 to 600mm. In common language from relatively near to really far away. it has an insane zoom range. I also wanted the possibilities if I wanted to film something. This ability is also possible with the RX10 III, up to 4k and with a solid stabiliser. So now I can for photo trips take this with me, and all other trips take the smaller rx100 with me plus iPhone as a backup. The major downsides of this camera, are Sony’s clunky menu system. Which apparently hasn’t been updated, however, I have learned to work around it with the rx100. Plus the size of the camera and of course the price of it. Remember to use #alantherock on your photos in Instagram, to be featured here on this site.Cheers Instafriends! You are always also more than welcome to leave a comment. Cheers Instafriends! So… 2017 has just started. Let’s seize this moment for a short reflection of 2016. I would like to use this opportunity to give my best wishes for a joyful New Year. I hope it will be your year in every positive way with lots of adventures. What was your most memorable trip in 2016? This question is followed by a small why? This is just to clarify in a few lines, why this was your memorable trip. Let me hear from you in the comment section of this post. Last but definitely not least, I went to China again and this was my really memorable and I would consider this as my most memorable trip of 2016. It was both to visit friends and to see more of its attractions, culture and beautiful sceneries. Even though I have been there a couple of times, there’s still plenty to see. This time I went to Chengdu, Hong Kong, Macau & Shanghai (Where I have been every single time). A memorable moment was indeed to experience real living Giant Pandas in the rescue centre in Chengdu. To see these mystical and beautiful animals in their controlled, but natural habitat was truly amazing. It was also my first time in Hong Kong and what a city. From the view of Victoria Peak, the vibrant atmosphere in the city to a short trip to Lamma Island, which is just one of the many small islands in Hong Kong. Hong Kong is simply stunning and there’s so much to see and explore. But let me hear from you in the comment section and remember, that you’re always welcome to check out my Instagram profile and use #alantherock. YYeeeaahhh!!.. alantherock.com is launched. Been working on this site for some time and finally it’s ready to be revealed. On this site, you’ll find a portfolio sample from my Instagram profile as well as a direct link to it. Followed by a section where some of my photos has been featured through the time. On top of all this, I have created a free download section, where photos can be found for free download in the beginning . Just remember to only use them with good intentions. “It’s all about the good karma “. But the plan is that this section will offer much more in the future. I’ve also added a section with a direct link to my society6 site. Society6 delivers print on almost anything from wall clocks and laptop sleeves to rugs and shower curtains. Last but not least I have added a gallery where everyone, who uses #alantherock in their Instagram hashtags will be featured. I’m really looking forward to seeing, how this will go and hope, that you will be a part of it. Just again, remember the good karma and good intentions It’s really easy just insert #alantherock next time, that you’re uploading a photo on Instagram. You’re always welcome to also give my Instagram profile a visit. Here you’ll, of course, find my full Instagram gallery and can follow it if you like.